NGA News - West Palm Beach, Fl. - Marsella Racing Kennel PW's Colt (Roanokee - Pistols N Roses) scored his 60th career victory Tuesday afternoon, March 29, at Palm Beach Kennel Club. Of Colt's 60 wins, 49 of those were on the 301-yard Sprint Course, making him the most prolific competitor in PBKC history on the track's shortest distance. Wearing the red blanket of post one, PW's Colt exploded out of the starting box, winning in box-to-wire fashion by more than three lengths in a super-quick clocking of 16.79 seconds. Last season, PW's Colt became the first super-sprint Greyhound in PBKC history to be crowned Track Champion. He shared the honor with kennel mate Where's Wise Guy (Trent Lee - Time Wise). Congratulations to trainer Regena Ruip, kennel operator Phil Marsella, owner Arden Phifer and to all the connections of PW's Colt. NGA News feature article - Multi-talented Flying Coal City has clinched two more illustrious annual awards that will serve nicely as bookends for his 2010 All-American captain’s title. For the third time in the 40-year history of the NGA’s Rural Rube and Flashy Sir Awards, both prizes will go to the same greyhound, as Coal City has been named last year’s best sprinter as well as its best router by the NGA membership and Review readers. The only other past honorees to sweep both awards in the same year were Cayman Went (2004) and Dominator (2000). Talentedmrripley also won both awards, but they came in separate years (2001 Rural Rube, 2002 Flashy Sir). NGA News - The Greyhound Hall of Fame will award Kelsey Rae Galbreath of Rockdale, Tx. the Jason Dean Hunt Memorial Scholarship during the annual Spring Meet awards ceremony at 7 p.m. on April 21 at the Hall in Abilene, Ks. The Hall of Fame Scholarship, in the amount of $1,000, was renamed last year to honor the memory of Army Spc. Jason Dean Hunt, who was killed in the shooting in November 2009 at Fort Hood, Tex. Hunt’s family has been active in the greyhound industry; in fact, his grandmother, Kay Smith, was inducted into the Greyhound Hall of Fame just two weeks prior to the incident at Fort Hood. The purpose of the Hall of Fame scholarship is to encourage post high school education to persons connected with greyhound racing. Galbreath, the daughter of Billy and Robin Galbreath, was reared on a greyhound farm in Texas and will graduate this Spring from Rockdale High School in Rockdale, Tx. She plans to major in Sports Medicine at Texas A&M University in College Station before entering medical school to become an orthopedic surgeon. NGA News - Lester Raines kennel's stakes race favorite Kelsos Ace High (Kelsos Fusileer x Kelsos Picilino) is seeking five in a row and a second consecutive win when he struts on track in Wednesday night's eighth race. Ace High will be wearing the red blanket in round two of the 52nd annual Distance Classic. The 76-pound male is the track win leader thus far this year with 12 wins and is the Classic favorite. Ace High's round one race has been played over and over as it shows the type of champion this male is. Ace High faces off with round one winner Kiowa Sky Selma (O'Donnell) in race eight. Before Ace High's feature Abernathy kennel's Bow Timeless will kick off the first heat in race four. Bow won his first round and should repeat his win. The sixth race is wide open with round one runners-up Waubun Queen B (Floyd & Porter) and D'Arcy kennel's Midnight Light vying for the coveted winning points. The tenth race is the final heat of the second round. Mohican Mink Mae hopes to repeat her first round win, but M's Free Lance (Floyd & Porter) could surprise if he rockets to the front as he did in round one. The field will be sliced to 16 after Wednesday (March 30). NGA News - If you were looking for the longshots, the Orange Park kennel Club had you covered in the third round of the 2011 Jacksonville Sprint Classic. On Friday evening all three of the undefeated greyhounds saw their streaks come to an end as valuable points were gobbled up by the competition. Speed was the key to success on the card as 3 of the 4 round were won in near box to wire fashion. The Lester Raines Kennel kept up their torrid pace too as they took home victories in 3 of the 4 qualifying races. NGA News -- The first round of the Distance Classic is in the books. The leading favorite Kelsos Ace High (Kelsos Fusileer x Kelsos Picilino) did not disappoint his fans. The season win leader and the fastest 660-yard athlete gave another memorable performance in race 10 Saturday night March 26. His victory is a must see race showing the sheer determination of this champion male and why he is the leading favorite in the stakes. Trained by Ken Lesperance Ace High was blocked several times and still turned in a victory to collect his first set of win points and four in a row. John Graham scored a pair of wins for the J. E. O’Donnell kennel with Kiowa Sky Selma and Mohican Mink Mae. Abernathy kennel’s Bow Timeless brought home winning points for trainer Kayruth Abernathy. Round two of the stakes race is Wednesday night where the field will be sliced to 16. NGA News -- Action in Bluffs Run's $60,000 Bracket Challenge on Saturday, March 26, saw one top-seed advance out of the Elite Eight match-ups and one top-seed fall. Out is Slatex Jade (Harlan Brothers), the top seed in the Bo Guidry Region. She finished second in the race but is out because two-time All-Bluffs Run team selection PG Tiger (Bean & Stout), a seventh-seed, broke second, took an early lead and pulled away with authority in the homestretch for a four-length win. West Palm Beach, FL - Round one qualifying action for Palm Beach Kennel Club's $20,000 Bob Balfe Puppy Stakes gets underway Wednesday afternoon, March 30. A field of 48 of the Kennel Club's most promising young up-and-coming youngsters will take to the oval in six qualifying events. The entire field will return for round two Saturday afternoon, April 2. The entries will be narrowed down to 32 for round three Wednesday afernoon, April 6. The field will then be cut to sixteen for the semifinals on Sunday afternoon, April 10.
the oval in the championship final Saturday afternoon, April 16. In Race 8, the well-positioned #1 Barn Burner Cat (One Nation - Tipp Renee, Royal Racing Team) and the Rader Racing Kennel duo of #5 Riverview Stevie (Kiowa Sweet Trey - CV's Mama Mia) and #8 Whats Next (Yahoo Omar - Flying Exorcist) should garner most of the wagering activity. Moving on to Race 10, another couplet of Rader's Raiders look promising in the sleek forms of #4 Thats Greek Tome and her brother, #7 Chumlee (Yahoo Omar - Flying Exorcist). However, you can't leave out the early-speed styling of #1 CU Bulletproof (WW Time Warp - Out Of Line, Royal Racing Team). There is no doubt that in qualifying Race 12, Rader Racing Kennel's #4 RK's Conk Gonk (Dragon Fire - RK's Tomb Raider) will be the one to beat. In Race 15, you guessed it, Norm Rader's #4 Turbo Razor (Kiowa Sweet Trey - Turbo Wind Blown) will be the public's overwhelming choice. Qualifying events will also be held in races six and fourteen. Click here for Round 1 race pages PDF, courtesy of NGA News. Vera Rasnake for NGA News - The World Classic is one of North America’s most prestigious stakes and this year’s race was memorable. The 17-month old Tiger Boy a.k.a. Le Tigre made one take notice of his roaring finish. The 71-pound male broke on top and quickly established that he was the one to beat. Yahoo Rader and Blazin Wildfire were also among the challengers. NGA News - Lester Raines kennel’s top dog and Distance Classic favorite will seek his first set of winning points in the first of four qualifying rounds in the 52nd annual Distance Classic. Two greyhounds controlled the Distance Classic in the past four years. Vince Berland’s Flyin Bridgeport won the race in 2007 and 2008 earning him a slot on the All-America Team and the Flashy Sir award for McAllister kennel. TMC’s Remedy, owned by Eddie and Rhonda McDonald, followed suit with back to back Distance Classic wins in 09 and 10 landing Remedy on the All-America Team both years for the former Filipelli & O’Donnell kennel. With both greyhounds retired there is no chance of an historic event. However, a win by the leading favorite Kelsos Ace High would be a first time Distance Classic victory for the Lester Raines kennel. Kelsos Ace High was the runner-up in the December 660-yard challenge. This year he has surpassed all expectations of trainer Ken Lesperance and is currently the season win leader with 11 victories this year. Kelsos Ace High also holds the season’s best distance time of 37.13. Fans watched the male reset it three times in a four-week period. Ace High (Kelsos Fusileer x Kelsos Picilino) is no doubt the leading favorite and his Juvenile stakes winning kennel-mate USS Gazillionair is also competing from the Raines kennel. Other headliners include Knock Out (Nova) who was also a finalist in the December 660-yard stakes. Capabal kennel’s Sweetheart Challenge champion RC Johnny Lobo is also in the lineup as well as the fall Sprint runner-up TMC’s Pistol and 660-yard finalist Kiowa Sky Selma-both from O’Donnell kennel. Charter kennel’s Strike Out King who generated a buzz earlier this year has moved back to the longer course and Wheeling’s former marathon track record holder Midnight Light (D’Arcy) is also a popular entry. While Derby Lane's Flying Coal City was cast in the national spotlight recently with his post-season honors, one of his littermates is lighting up the board at Wheeling Island. Flying Culloden isn't flashy like his All-American brother, but he's been steady and solid throughout his career - the consummate blue collar worker. Since late December, the sprinter has been noticed. In his last 15 top grade races, Culloden - a March 2008 greyhound out of Kiowa Sweet Trey-Flying Crestline - has 7 wins, 5 seconds and 2 thirds. Eartha (racing name: Al Kiowa Dirt) is a beautiful brindle female born in January of 2008. She and her brother Sandman are closely bonded and would love to live together but understand that it may not be possible. Eartha is not a "cat person" but gets along very well with the other greyhounds in her foster home. She loves to help herself to the toys in the toy basket. True to heart, she is as pretty on the inside as she is on the outside. Sandman (racing name: Al Kiowa Sand) is a handsome, brindle male born in January of 2008. 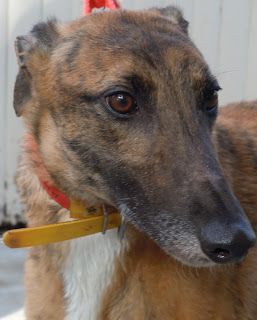 This husky boy is very friendly, enjoys attention and gets along great with the other greyhounds in the foster home, which he shares with his sister Eartha. Sandman seems to be fine with small dogs. This handsome pair is available through GratefulGreyhoundsNY.com. NGA News - Derby Lane’s Sprint Classic champion Hi Noon Renegade continues to shine the brightest over the 550-yard course and will seek six in a row Thursday night in race 10. The soon to be two year-old brindle male is making the "nay sayers" repent who wrote him off in the stakes race. The son of the late Dodgem By Design and Bryan’s Baby gave another impressive performance last Saturday night and was not denied the win. He was pressured throughout and did not give it up racking up his eighth win this season. Renegade was not taken seriously when he entered the Sprint Classic, but won the stakes as the youngest entry this year. Track announcer and Program Handicapper Jim Peake has installed Renegade as the program favorite. Cool Pinto Bay (Charter kennel) is also in the race and is going for four in a row. Pinto Bay moved up from grade D. Kiowa Lazy Lott, who pressured Renegade, is also in the Thursday night field. Distance Classic watch: Kelsos Ace High (Kelsos Fusileer x Kelsos Picilino) won his 11th race of the year Wednesday night leaving the field in a nine and a half-length wake. Ace High remains "top dog" of the meet with 11 wins. Ace High is trained by Ken Lesperance of the Lester Raines kennel and is the leading favorite in the Distance Classic stakes that starts Saturday night March 26. Ace High’s record this year is 19/11-2-0-2. The draw for the first round will be featured on Vera’s News tonight with a sneak peek at the races and posts. NGA News - The Sweet Sixteen Round of the $60,000 Bracket Challenge at Bluffs Run on Wednesday, March 23, turned wild, producing five upsets in the eight match-ups. Still, two No. 1-one seeds are left in the field for the Saturday, March 26, Elite Eight. The biggest story comes out of the Lydia Mason Region. Earls Equinox (River Bluffs), a 15th-seed, pulled off his third straight upset by knocking off sixth seeded Cheeky Monkey (Blake & Black). NGA News - Post positions have been drawn for Friday night's $75,000 Hollywood World Classic, to be staged at Mardi Gras. Leading point-getters Yahoo Omar (2009 Classic champ) and young Packin The Heat have drawn the 3 and 8 box positions, respectively. Each compiled 43 points in the preliminaries, notching three wins and a third apiece. NGA News - Enough playing around must have been what the Lester Raines stars must have thought in round two as they captured 3 of the 8 qualifying races on the card. Leading the way was standout Really Xtreme. Although he was in tough, against Paddy Whacker and company in the 10th race, he didn't let that phase him. He stuck to the game plan, and this time out he used his early speed to take control of the race. He rushed hard to the 1st turn and was in command from that moment on. Throughout the race he increased his lead with each and every step he took and crossed the finish line in the best time on the card at 30.55 seconds. Five and a half lengths better than the rest of the field, Xtreme remained undefeated in qualifying! NGA News - Youngster Packin The Heat and veteran Yahoo Omar head the final field in the $75,000 Hollywood World Classic. The final is set for Friday night, Mar. 25, at Mardi Gras. Wayne Strong's Packin The Heat and Norm Rader's and Robert Litke's Yahoo Omar both notched 43 points in qualifying with three wins and a third apiece. For Packin The Heat (from the O'Donnell Kennel), that third came in the final round, Mar. 17--a night that saw Omar (racing for the Joe Trudden Kennel) win his third straight heat. NGA News - Derby Lane's Sprint Classic champion Hi Noon Renegade is not about to give up his place in the spotlight. Saturday night March 19 the soon to be two year-old brindle male added another win to his young portfolio. The son of the late Dodgem By Design x Bryan's Baby gave an exceptional performance and was not going to be denied his 13 th career win in 29 starts. NGA News - The $60,000 Bracket Challenge at Bluffs Run is set for the Sweet Sixteen on Wednesday, March 23. But that's after the round of 32 on Saturday, March 19, produced five upsets. The big shakeup came in the Bo Guidry Region where three of the four matchups saw the lower seeded greyhound advance. Look My Way from D.Q. Williams Kennel had run through some rough times not winning a top grade AA race since January 13 but has flipped the switch once again capturing back-to-back races earning the Greyhound of the Week honors. Look My Way had an outstanding year in 2010 capturing the $50,000 Texas Round Up Championship and the Au Revoir finale on New Year’s Eve earning him a spot as a second team All-American. As 2011 began, Look My Way continued to consistently hit the paysheet but there was one thing missing, the wins. If a bill that cleared a Florida state senate subcommittee last Thursday is approved by the legislature, greyhound tracks in the Sunshine State would no longer be required to conduct any live racing in order to continue operating slot machines and card rooms. It is a chilling proposal, and one that may well be coming to Thoroughbred racing sooner than you think. The state of the greyhound industry is a sort of exaggerated, worst-case scenario of the Thoroughbred game, marked by declining attendance and handle, purse stagnation, a shortage of owners, sharp reductions in breeding stock and racing dates, and negative publicity generated by animal-rights activists. 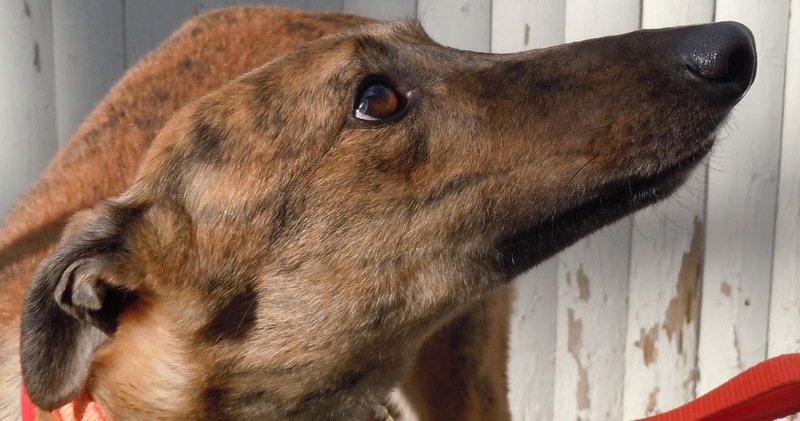 Card-room and slot-machine revenue have kept the greyhound industry on life support as its live-racing handle has dwindled to embarrassingly low numbers that can’t begin to pay the overhead at most of Florida’s 13 remaining greyhound tracks. Southland Park, via TrackInfo.com -- It is that time of year again for the annual "Hound Madness" stakes at Southland Park Gaming and Racing, where their March promotion is in full swing leading up to the April 1st championship. Sixty-four greyhounds have been seeded and placed into four regions. Unlike most other stakes events where points accumulate and the highest advance, this stakes event simplifies it down to one clear objective-- beat the greyhound you are bracketed with to advance. For those attending the live racing, Southland Park will be running a marketing promotion in conjunction with the event. For every $10 spent on live racing during the month starting Saturday, participants will earn one "entry" to vote for the greyhound they think will advance in each match-up. Drawings will be made from those winning boxes for an escalating prize structure up until the finals where someone will walk away with $1,500 in cash. NGA News - While Derby Lane's Flying Coal City was cast in the national spotlight recently with his post-season honors, one of his littermates is lighting up the board at Wheeling Island. NGA News - Wayne Strong's youngster Packin The Heat, undefeated in three eliminations, leads the way in tonight's (Thursday's) semi-final 2nd round of Mardi Gras' $75,000 World Classic. Veteran 2009 Classic champ Yahoo Omar, twice a winner in qualifying, is lurking as the second-highest point earner in the stake. Packin The Heat (Iruska All Star-Noah's Pollywog), who turned 2 last week, will go for his fourth straight qualifying win from the 7 hole in tonight's first race. Packin The Heat, who races for the James E. O'Donnell Kennel, is the only undefeated entry in the stake, leading the field of 40 remaining survivors with 36 points. NGA News - Capabal kennel's Aerial Battle (Dodgem By Design x Abita Cruzin) marked his 50 th win Tuesday night March 15. Time to figure out just who is the best greyhound over 550 yards is at the Orange Park Kennel Club. That's right, the best time of the year is back, stakes racing time, and it comes your way in the 2011 edition of the Jacksonville Sprint Classic. NGA News - Nova kennel's Hi Noon Renegade (Dodgem By Design x Bryan's Baby) is going for four in a row Wednesday matinee March 16. The recent Sprint Classic champion continued his winning spree after collecting the trophy and winner's purse in the March 5 stakes. Renegade has 10 of 13 money finishes this meet. Owned by Charles Haliburton, III of CO, the 70-pound male has been installed as the program favorite in race six. The matinee race will run at approximately 1:39 pm, est. NGA News - The Greyhound Hall Of Fame's annual fund-raising Dinner/Auction is scheduled for Tuesday evening, Apr. 19, during the NGA Spring Meet at the museum in Abilene. Consignments and prizes for the auction and raffle segments of the program are now being accepted and can be submitted to the NGA either by phone, fax or e-mail. The first-ever dinner/auction was held last year at the fall meet, but beginning this year, this event will now be a permanent part of the NGA's Spring Meet program. The Hall Of Fame Club banquet will continue to be held during the Fall Meets. All proceeds for the event will go directly toward the day-to-day operation of the Hall Of Fame. Last year's event was a huge success, with more than $24,000 raised for the cause. Auction items and prizes again being sought for the upcoming event include stud services, greyhound services, pups, artwork, books, clothing items and gift certificates. Vince Berland of Flying Eagles Kennel has started the ball rolling with consignments, offering stud services to Flying Hydrogen, Flying Train, Dragon Fire, BD's Grayson, Flying Stanley and Flying Oak. A list will be updated daily and available on this website, starting later this week. A new face broke through this week to earn this week’s honors as the Greyhound of the Week, TNJ Tuff Enough (Heart Rumble* - TNJ Peaches) from Big Water Kennel trained by Sissy Sabell and owned by James T. Dietz and William E. Maierhofer. After taking one year to achieve top grade AA competition, TNJ Tuff Enough has made the most of it quickly by earning victories in just his second and third grade AA starts. The first of which came on Saturday evening March 5 in the featured tenth race. Drawing the advantageous #1 rail post position, TNJ Tuff Enough was in tough against a field including top grade winners Atascocita Chloe, Night Frisco, Look My Way, and the hottest greyhound at the time at Gulf Greyhound Park, Cry Homer. Sent off as a longshot at odds of 11 to 1, TNJ Tuff Enough took full advantage of the rail clearing the first turn in second behind 22 to 1 longshot Like A Charm. As the race progressed, TNJ Tuff Enough slowly closed the gap on the leader and when they turned for home, accelerated down the stretch to get up just in time winning by a nose in a career best time of 30.04 seconds. TNJ Tuff Enough was fortunate once again to draw the #1 post position in his next start Friday evening March 11. This time, LQK Kennels, Inc. would send out Riley Jaymes to get some revenge for the defeat of their top superstar, Cry Homer. The field also included grade AA winners Nina’s Wagster and C Ya Tom Collins along with recent grade A winners Atascocita Spare and MW Neptunia. TNJ Tuff Enough knows how to `ride the rail` and used it to his advantage again achieving the lead around the first turn. After cruising on the lead with a safe margin of a length or so, TNJ Tuff Enough could literally hear the footsteps of a strong closing Riley Jaymes at the top of the stretch. The finish line could not arrive soon enough as Riley Jaymes swung wide but just missed by a nose as TNJ Tuff Enough held on to win his second consecutive top grade race at odds of 8 to 1. It has been an `all or nothing` year so far in 2011 for TNJ Tuff Enough with a record of 11/5-0-0-0 but the career record looks much better at 37/9-10-2-3. Congratulations to Big Water Kennel, trainer Sissy Sabell and of course the star of the show, TNJ Tuff Enough for this week’s achievements. NGA News - There's an excellent chance that at least two members of the 2010 All-America team will be on hand to personally accept their AA plaques at the Hall Of Fame on Thursday night, Apr. 21, during the NGA Spring Meet. Team captain Flying Coal City and Southland superstar CT Buck Wild should steal the spotlight that evening--as has always been the case whenever a canine awards-winner personally shows up for the awards ceremony. Coal City, who'll also be receiving the NGA's Rural Rube and Flashy Sir Award that evening, is recuperating from a shoulder injury suffered last week at Derby Lane and is expected to be convalescing for an extended period of time in Abilene. There's also the possibility that, if recovery does not go as planned, that the multi-talented stakes winner will be retired. Coal City, owned by Vince Berland and races for the McAllister Kennel, arrived in Abilene late last week. CT Buck Wild, owned by Charter Kennel, was retired earlier this year and arrived this morning (Mar. 14) at the Brotherton farm in Abilene, awaiting her eventual new role as a mother of promising young pups. Buck Wild dominated the competition at Southland the last two years. NGA News - Rader Racing Kennel's Tuff Stuff lived up to his name as he easily won the 35th running of Palm Beach Kennel Club's $50,000 Arthur J. Rooney, Sr. St. Patrick's Invitational. Breaking from the eight post position, Tuff Stuff rushed the first turn, took command on the backstretch, and never looked backed, winning by two lengths in a very swift timing of 29.39 seconds. "Tuffy" was also the winner of last January's $50,000 He's My Man Classic. He collected another healthy paycheck of $25,000 for his Invitational victory. Norm Rader had another reason to keep those "Irish Eyes Smiling" as his other entry, Custom Trent , finished second. This marks the second time that Rader's Raiders have swept the $150,000 "Big 3" stake series, having accomplished this rare feat in 2007. Flying Magenta and defending St. Pat's champion JS I Am Legend finished third and fourth, respectively. NGA News - March Madness begins at Bluffs Run on Wednesday, March 16th with the first round of the $60,000 Bracket Challenge. To follow the Bracket Challenge, Bluffs Run Racing Coordinator Mark Pendgraft has a bracket waiting for you. Go to www.bluffsdog.com and download your own bracket. Capabal kennel's JW Titleist (Dave The Dog x Abita Cruzin) is on a roll and is going for five straight Saturday night. The 75-pound male owned by John Bladen and Walter Wasik is 10 of 16 in the money this year. He will face-off with the program favorite Turbo Laird (McAllister) who is seeking the hat trick in the same tenth race Saturday night. Before that race keep your eye on Midnight Light (D'Arcy). She is an import from Wheeling that set the distance track record in WV for Ryan Farms kennel. She is a favorite in the upcoming Distance Classic. Round one begins March 26. View JW Titleist's lines and race replays. It’s not a secret that I like greyhound stakes races. Even when I got interested in the sport years (and years) ago, I enjoyed the entire tournament. Checking out the standings after each round, watching how a pup overcame starting in its least favorite box to gain points. But, up until the last few years, I didn’t enjoy the one-race stakes events. I missed all the qualifying, I guess. Greyhound racing and March Madness: They are two of my favorite things. When they can be combined, it’s even better. Southland starts its version of the blend, when the opening round of the Hound Madness Stakes starts Saturday night. There’s no point system in this one. Each greyhound is bracketed against another. So, a pup could finish second, and not advance because it came in behind the dog it was facing. Is there a Hotter Greyhound right now? 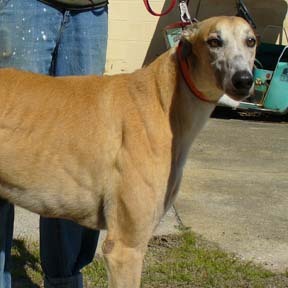 It would be hard to argue that any greyhound in the country is hotter right now than Orange Park's Paddy Whacker! Since coming back to the 550 yards course, after the finals of the 2011 Orange Park Derby, Paddy Whacker has been on a mission. Winning five of his seven races, and setting a new track record TWICE, this greyhound has come to prove a point, and that is just what he has been accomplishing. Is there a return to racing at Phoenix on the horizon? There's been a lot of Political fighting going on between our Arizona State government and the Tohono O'odham Tribe from Tucson in regards to building a casino off the reservation. Here is how it all started. The federal government swapped land with the Tohono tribe that is located on 91st avenue and Northern road. Alot of our citizens here considered what the Feds did was horrible back door move not understanding the full ramifications of this swap. It is situated about a mile and a 1/2 from our entertainment center which is called Westgate Center where our Arizona Cardinals, Phoenix Coyotes hockey team play, a bunch of restaurants, and bar n grills. JaxKennel.com - For Saturday Evening we will be looking at the 4th, 7th, 9th, 11th, and 15th races. Throughout the years, early speed has always been an advantage around the La Marque, Texas oval on the Gulf Coast. 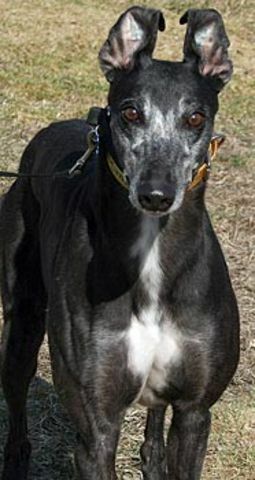 This week’s Greyhound of the Week, Deadliest Catch from Turner Racing Kennels, personifies that quality with loads of speed from the 550-yard starting box. After arriving here from Dubuque, Iowa towards the end of 2010, Deadliest Catch took some time to adjust to the quality of speedsters racing at Gulf Greyhound Park and finally broke through with a victory in grade A after seven starts. From that point on, Deadliest Catch has remained in top grade AA continuing to improve with his first grade AA win on January 28 and has now strung two wins together to earn this week’s honors. NGA News - America's most revered greyhound Flying Coal City was taken off the active list at Derby Lane immediately following his March 9 race. Coal City's trainer Barbara McAllister was waiting for her star after the race and was gracious enough to allow out of state fans that came to the races just to see Coal City take their photo with him. Vince Berland confirmed via telephone that he would be receiving the National award winner this upcoming weekend. NGA News - For the third time in a month Lester Raines kennel's distance star Kelsos Ace High (Kelsos Fusileer x Kelsos Picilino) lowered the 660-yard time. Ace High started his speed spree on Feb. 9 recording a 37.27. Three days later the 76-pound male ran a length faster setting a new time of 37.20. Wednesday night March 9, Kelsos Ace High erased the 37.20 with a new 37.13. Ace High broke third and was making up ground on Flying Coal City who took charge early, but gave way to a shoulder injury in the homestretch. Coal City went from a length lead in the homestretch to ten lengths behind the leader for second. Kelsos Ace High blew past Coal City for a ten-length victory. Ace High is an early favorite in the upcoming Distance Classic that begins March 26. John Kelly of New Jersey owns Kelsos Ace High. Other news: It has been confirmed that Flying Coal City has been taken off the active list and may be heading to Kansas to nurse a shoulder injury. An official decision to move the champ will be made by Friday March 11. West Palm Beach, Fl. - Post positions have been drawn as Palm Beach Kennel Club prepares for its most exciting afternoon of the year: the running of the $50,000 Arthur J. Rooney, Sr. St. Patrick’s Invitational on Saturday afternoon, March 12. Both Tuff Stuff and Custom Trent will be going for their respective seventh-consecutive victory. Those looking for a four-leaf clover of their own include last year’s Invitational champ JS I Am Legend and last season’s co-track champion Where’s Wise Guy. The big pay-off spoilers seeking to make their history-making statement are Flying Magenta, Atascocita Tiera, Kiowa Dodie and Whiskaway Emma, also known as the "Fearless Foursome". The 35th running of the $50,000 Arthur J. Rooney, Sr. St. Patrick’s Invitational will be held in Saturday afternoon’s twelfth race with an approximate post time of 4:00 p.m.
* For the kids, Cookie The Clown will be here with face painting and balloons! * Ace The Bear Will be on hand! * Bugler Lawrence Morse will be entertaining between the races! * Greyhound Pet Representatives will be on hand to answer any questions you may have about adopting one of these loving dogs! * Irish Food Specials in the Paddock and Terrace Restaurant! * Prize Drawings! Enter for your chance to win a Gaylord Palms Getaway! Plus, all drawing coupons from the He’s My Man Classic, Derby & St. Pat’s will be eligible to win a 3-day / 2-night stay at Hawk’s Cay Resort in the Florida Keys! NGA News - It would be hard to argue that any greyhound in the country is hotter right now than our very own Paddy Whacker! NGA News - Two NGA members, who are avid NGA Meet supporters, have stepped up to offer a pair of new, unique stakes— a la the traditional Borchers Stake—for the upcoming Spring Meet (Apr. 18-23) in Abilene. Chad Palmsteen, Minnetrista, MN, and Steve Schlachter, Pawcatuck, CT, are each offering $500 purses for two new final races that will involve fourth-place finishers that would normally see only one round of action at the NGA Track Stakes. Palmsteen is calling his stake the “Cooler Stake” for pups that will have competed on Monday and will come back on Thursday, while Schlachter is countering with a “Warmer Stake” for a half-dozen also-rans from Tuesday's races who'll run again on Friday. The field for Palmsteen's Cooler Stake—to be held as the last race on Thursday—will include the six fourth-place, auction-consigned finishers that had the best times amongst all of Monday morning's entrants. The field for Schlachter's Warmer Stake—to be held as the next-to-last race on Friday (just before the Borchers)—will include the six fourth-place, auction-consigned finishers that had the best times amongst all of Tuesday morning's entrants. In each event, the $500 purse will be divided accordingly: $250 to the winner, $150 for second, and $100 for third. Aside from the additional purse money for nominators, the stakes are intended to provide another dozen nominees an opportunity to showcase their talents during the week, thus improve their chances at being sold for a fair price in the auction later in the week. Palmsteen and Schlachter said they wanted to give pups that might have had some bad racing luck and got nudged out of the money in the first round another opportunity to show that they're worthy of consideration in the auction ring. Ken Biehle is one nominator who's already expressed enthusiasm for the stakes. Ken recalled having a pup last year that had a mediocre first-round race, but qualified for the Borchers Stake. For those of you who weren't in the know - the World Series of Poker held a series at Palm Beach Kennel Club. West Palm Beach, FL (Mar. 1) – Further proof that big-time No-Limit Hold’em tournaments are fast becoming the private domain of a newer, younger super-generation of poker players was on full display this week at the Palm Beach Kennel Club. John Riordan, a 19-year-old professional poker player (that’s no misprint), won the most recent World Series of Poker Circuit championship. He collected $210,180 for first place. Riordan was also presented a WSOP Circuit gold ring, the coveted prize awarded to all winners in poker’s biggest and most prestigious national tournament series. Riordan resides in Palm Beach Gardens, FL. He first began playing poker online in free-money games at age 13. He started playing for real money when he turned 18 and competed in steadily bigger-stakes games as both his bankroll and skills grew. Riordan now plays in high-limit cash games almost daily, often buying into $200-$400 Pot-Limit Omaha games, $40,000 at a time. He is also becoming a regular player in many of the highest stakes live cash games in South Florida. 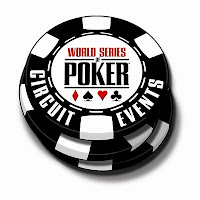 However, until the WSOP Circuit came to Florida, Riordan’s tournament options were severely limited. In fact, he had no tournament resume whatsoever. Due to his age (under 21) he wasn’t able to play in most other tournaments throughout the U.S. Even with this dramatic victory, Riordan won’t be eligible to compete in the WSOP held in Las Vegas until the year 2013. Following his first live tournament victory, Riordan proudly posed with a huge pile of poker chips, his newly-won WSOP Circuit gold ring, and “Ghost” a five-year-old honey-coated greyhound who races regularly at the track. It was hard to tell who was more satisfied, Riordan after being crowned the newest WSOP Circuit champ, or the doll-faced greyhound receiving loads of affection from poker players and spectators alike. TrackInfo.com -- As a new feature, every Wednesday we will be featuring a retired racing greyhound available for adoption. This week our featured retired racer is Starz Home, and Linda Jensen says, "she may be small but she’s in control!" This little cutie is a friendly alpha dog. She likes to make her presence known around the other dogs but once they acknowledge her she ignores them. She is very friendly towards people and walks well on a lead, but she is not a friend to felines. Home, as she is called in the kennel, raced at both Raynham/Taunton and Palm Beach. It looks like her biggest competition was not so much other dogs-- it was the first turn! The McGrath Foundation will be the beneficiary of a $120,500 donation as Australia's greyhound racing community campaign, Go The Pink Dog!, ended its month-long fundraising effort in February . 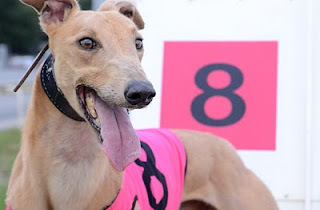 The campaign officially came to a close on February 28th, with the greyhound racing controlling bodies of New South Wales, Victoria, Western Australia and Tasmania all pitching in to help fund McGrath Breast Care Nurses right across Australia. 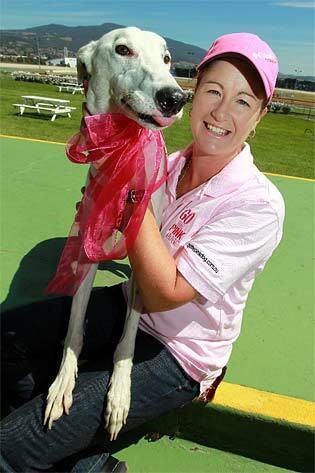 According to McGrath Foundation spokeswoman Tracy Bevan, "in its first year, the Go The Pink Dog! campaign raised an amazing $50,000". This year, every time a greyhound wearing the pink rug won a race in any of those four Australian states throughout the month of February, $500 was donated to the McGrath Foundation. In total there were 241 pink dog winners across the entire month, including Spring Rose in Bathurst’s aptly-named Go The Pink Dog Stake on the final day of the campaign. Greyhound Racing New South Wales made a significant contribution to the cause with the McGrath Foundation receiving a $43,000 windfall from NSW’s 14 TAB tracks and the Glenn McGrath signed and framed pink rug which was bought by Australia's largest breeder Paul Wheeler at auction. GRNSW Chief Executive Brent Hogan said the Go The Pink Dog! campaign had helped raise awareness of breast cancer while also recognizing the important contribution women make not only to greyhound racing, but also to sport in general. “The Go The Pink Dog! campaign has certainly cast a new light on greyhound racing and the combined efforts of the four states will provide the McGrath Foundation with a substantial donation that they will be able to put to good use,” Mr Hogan said. “The amount of people who have been engaged by the campaign throughout February has been enormous and they’re people who haven’t necessarily had anything to do with the sport before now. New South Wales greyhound racing headquarters Wentworth Park finished as the most profitable NSW venue for the McGrath Foundation with the CBD circuit pooling $6,500 from the efforts of the pink-clad greyhounds throughout February. It was followed by Newcastle’s Betchoice Gardens ($5,500), Grafton ($4,500) and Lismore ($4,000). NGA News - Nova kennel owners Hans and Elly Limmer were all smiles in the winner's circle when their young star Hi Noon Renegade captured the Derby Lane Sprint Classic. Over 3,800 fans attended and the handle that was just shy of $500,000 for the evening races. The youngest in the field stole the show with an exceptional performance. Hans Limmer thanked the fans for coming to the races in a classy winner's circle interview. He also recognized Renegade's rivals. NGA News - The Wilhite Kennel vaulted past Boeckenstedt to take the lead in the $60,000 Kennel Championship after the third round at Bluffs Run on March 5. Wilhite had entered the third round eight points behind Boeckenstedt, but a 44-point performance from Wilhite's four greyhounds gave the kennel a 110-106 lead over its rival. Be there Saturday afternoon, March 12th! West Palm Beach, Fl. - Palm Beach Kennel Club has named the eight Greyhounds who will be competing Saturday afternoon, March 12, in the 35th running of the $50,000 Arthur J. Rooney, Sr. St. Patrick’s Invitational. Rader Racing Kennel will be looking for a clean sweep of this year’s $150,000 "Big 3" Stake Series. In January, Tuff Stuff collected the $25,000 first-place prize in the $50,000 He’s My Man Classic, and just last month, Dynamic Trent was victorious in the $50,000 3/8ths Mile Derby. NGA News - Multi-talented Flying Coal City has clinched two more illustrious annual awards that will serve nicely as bookends for his 2010 All-American captain's title. For the third time in the 40-year history of the NGA's Rural Rube and Flashy Sir Awards, both prizes will go to the same greyhound, as Coal City has been named last year's best sprinter as well as its best router by the NGA membership and Review readers.